On his arrival in Windsor and after buying himself a brown horse at Laban White’s auction in February, Dr Dowe set up a partnership with Patrick Gray as Medical Practitioners, something similar to the arrangement he had with Dr Mallon in Maitland. However, in July 1840 a notice appears in the papers bearing the following information :- “The partnership subsisting between Patrick Gray and Joshua Dowe, in Windsor, as Medical Practitioners, only will terminate on the 1st Oct.; Mr Gray having, according to the terms of the contract of co-partnership, given Mr Dowe intimation of his intention of dissolving the concern by giving up his interest in the same. The Drug and Grocery Dept. will still continue as heretofore, to be carried on and conducted by Mr Gray solely.” Mr Gray, Chemist, has been in Windsor for 2 years already and begs his customers to remain with his service. The 1841 Census reveals that Joshua Dowe lives in Bridge Street, Windsor. The brick house, finished, is inhabited by 2 males, between 21 and 45 years of age. One arrived free and one is in private assignment as a domestic servant. One is Church of England (this would be Dr Dowe) and one is Mahomedan or Pagan. During this formative year in Windsor, Joshua made himself busy with the application of his profession....which was not always a pleasant task. He appears at inquests into deaths which tell us something about the way life was in those times. In July 1841 he was required to give evidence in the case of Isabella McKenzie ( MacKenzie ), about 21/22 years old and of slight build, late of Windsor, who was charged with the wilful murder of a male infant, on the 18th April last, at Richmond, by casting the said child into a privy immediately after birth and with killing and slaying the child by neglecting to tie the navel chord, whereby the child died. She was also charged with concealing and failing to report a birth. Isabella had worked for Mr George Bowman first as a housemaid and laundress and then as nursery maid. She had been hired as a single woman but had told the Bowman children that she was going to get married soon. Although Mr Bowman had noticed the prisoner had been getting bulky of late he did not know of her circumstances until the discovery of a white bundle in the privy out in the garden where Isabella had gone at night to give secret birth to her child. Dr Dowe’s evidence was that although the child had breathed, owing to the lungs being inflated, but he could not undertake to swear that such had been the case. On getting this answer, Mr Purefoy, who represented Isabella, submitted that according to the latest authorities this was sufficient to relieve him of any difficulty as to the capital part of the charge. He deposed that the statements of good character rendered by both Mr and Mrs Bowman, that the second charge of concealment of a birth may be mitigated somewhat. Did Dr Dowe give Isabella a life-line as a result of his evidence? Whatever the case, Isabella was found guilty of the second charge, which was beyond interpretation, and was sentenced to 12 months in Sydney Gaol. On the 24th Dec. 1841, Dr Dowe was present at Mr Coffey’s Hotel when an inquest was held on the body of Henry Cordis, Sergeant in the 96th Regiment. It appears that Dr McNish, perceiving that he was intoxicated while attending the Military Hospital reprimanded him for his conduct and threatened to report him to the Colonel. Shortly afterwards Cordis swallowed 1 1/2 ounces of Laudinum and although the stomach pump was used he died shortly afterwards. Dr Dowe, after a post-mortem, certified the deceased had died from poison and a verdict of “felo de se", caused by inebriety was returned. In May , St Patrick’s Orphan School is supported by public donations and Dr Dowe gives One Pound. In 1842 life moves at a pace for Dr Dowe as he becomes more enmeshed in the fabric of Windsor and the Hawkesbury District becomes his new home away from Ireland. The year begins with a celebration of temperance at the Catholic Chapel put on by the Windsor Total Abstinence and Temperance Societies. Dr Dowe gave a speech about the effects of drunkenness stating that 9 out of 10 cases of sudden death were due to the affliction. Afterwards, all the attendees, including Robert Fitzgerald, Dr Reedy and the good Reverend, had a lovely luncheon. In March he is elected to the committee for St Patrick’s Orphan School along with Robert Fitzgerald and Edmund Burke ( James Doyle’s sister’s son-in-law, who built the Doctor’s House). In June Dr Reedy resigns his position as Coroner of Windsor and embarks for India with the 28th Regiment and Dr Joshua Dowe Esq is appointed to be Coroner for the District of Windsor. In July the first evidence of Joshua’s interest in horse racing becomes apparent when we learn that at Windsor Racecourse, for the prize of 15 Pounds, Mr E. Cox and Dr Dowe pit their horses against each other. Michael Bryan, riding Mr Cox’s mount wins the day. 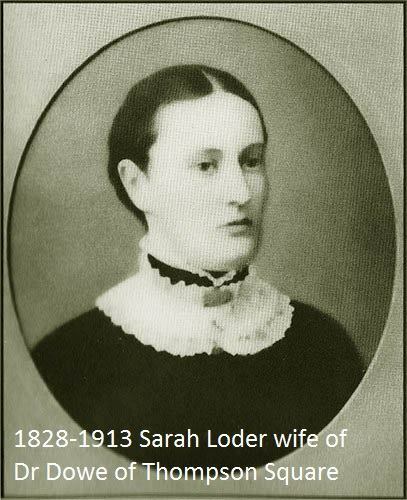 It is not until the very last day of 1842, the 31st of December, that Dr Joshua Dowe, seals his future in Windsor, when he marries at Caddia (Cattai), the very young Sarah Loder, a native of Windsor, daughter of George Loder, pioneer settler of the Hawkesbury and of the Liverpool Plains. Sarah’s mother is Mary Howe, daughter of the pioneer settler and explorer of the Hunter, John Howe. The 1828 Census has George and Mary Loder living at Portland Head. Sarah is just 15 and Joshua is 29 at the time of their marriage. They have 10 children. 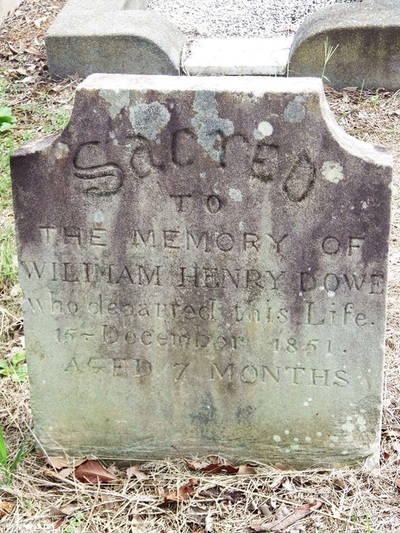 The first, Susan, born in 1843 dies in the same year and another child, William,( interred in the cemetery of St Matthew’s C/E Windsor ) born in 1851 also dies in the year he was born. Their 8 surviving children live long lives. In 1855, Dr Dowe attempted to buy Red House Farm – Andrew Thompson’s famous place where he built Red House – from a Mr Mulhearne. This led to a serious court case which can be read in TROVE ( date 24 April, 1855 ) where Dr Dowe escapes fraud charges but loses his claim on the farm. In October ,1857, a procession of 160 happy children from the Wesleyan Chapel school in Macquarie Street proceed to Thompson Square, form a ring outside Dr Dowe’s house, and sing a hymn which had been selected for the “choir” of their infant voices. Was this a form of blessing for the doctor’s new home? 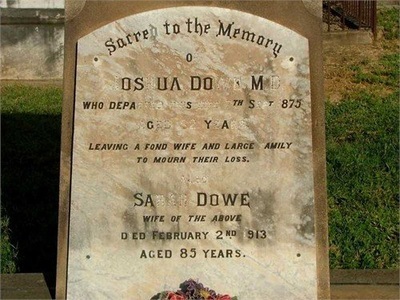 Dr Dowe, during all his years of service to the community had completed many autopsies; appeared before many courts to give evidence; had treated countless ill and injured; had participated in local politics; had spent 12 years as medical officer for the Hawkesbury and Benevolent Society; had held land and bred horses.....and probably knew where most of the district’s “skeletons” were “buried”. But, the time came for him to leave Windsor. He had land holdings in Tamworth which needed his attention and he had to provide for his large family. He had spent just 3 years in his gracious home in Thompson Square. When, in 1875, news comes of the death of Dr Dowe in Tamworth it is stated that he was held in the highest esteem by the people of that town. He was 62. In 1913 an obituary is published for Mrs Joshua Dowe ( Sarah Loder ). She left a family of 7 sons and one daughter, 35 grand-children and 12 great-grand-children.